10월 24일부터 26일까지 서울 COEX에서 개최된 IMID 2018에서 LG Display는 OLED의 다양한 활용 방안을 제시하며 큰 관심을 이끌었다. 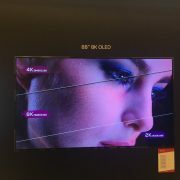 LG Display는 올해 초 미국 라스베이거스 CES 2018에서 공개한 8K OLED TV를 국내에서 처음으로 공개하며 관람객들의 이목을 사로잡았다. 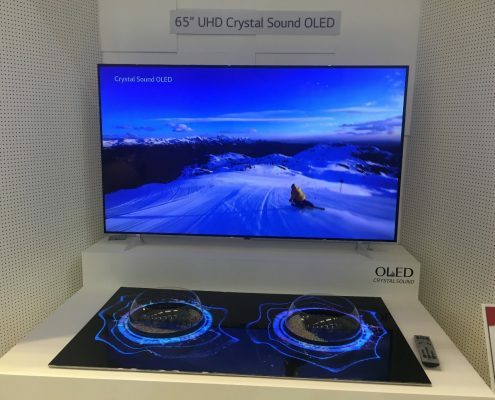 이 제품은 현존하는 OLED TV 중 가장 큰 크기로써, UHD 해상도보다 4배 더 선명한 화질을 구현한다. 또한, LG Display는 사운드 시스템을 패널에 내재화해 화면에서 사운드가 직접 나오게 만든 65인치 CSO(Crystal Sound OLED)와 벽과 완전히 밀착시켜 거실의 인테리어 효과를 높일 수 있는 77인치 UHD 월페이퍼 OLED 제품을 선보이며 OLED의 다양한 활용 가능성을 제시했다. 이 밖에 자동차 부문에서 full dashboard 구현하기 위해 flexible OLED를 활용한 12.3인치 Cluster를 전시하였으며, 조명 부문에서 디자인 요소를 가미한 다수의 OLED 조명과 OLED를 활용한 자동차용 후미등도 선보였다. 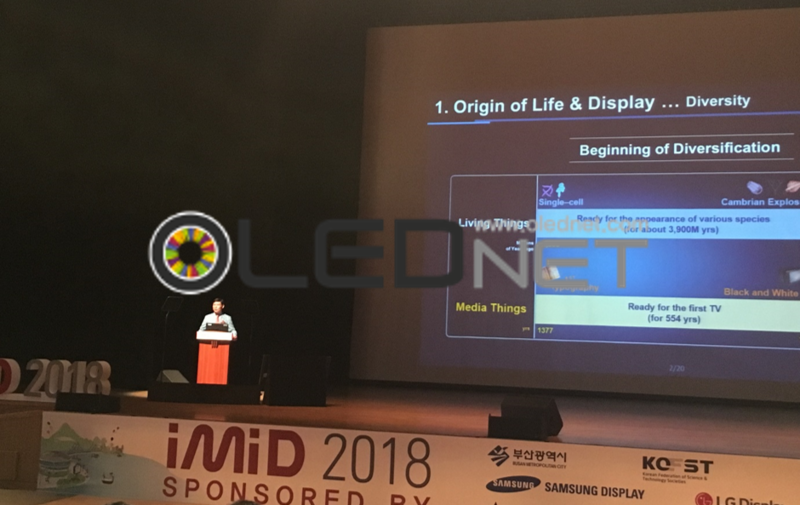 한편, LG Display의 한상범 부회장은 “이번 IMID 2018 전시회에서 차세대 디스플레이인 OLED 기술력을 선보여 시장과 고객에게 차별화된 가치를 제공하고, 이를 통해 디스플레이 시장을 지속적으로 선도해 나갈 것”이라고 언급했다. 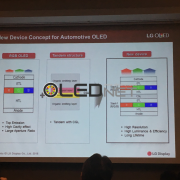 At IMID 2018 held in BEXCO, Busan on August 29, Kim Kwan-Soo, research fellow of LG Display presented about a new OLED technology for automotive displays. 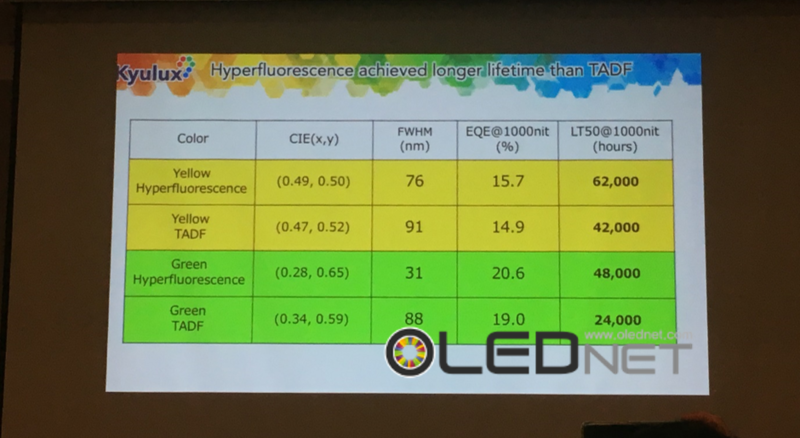 Kim said that RGB OLEDs applied to mobile devices and WRGB OLEDs applied to TVs do not satisfy customers’ needs in terms of life span. To solve this issue, he introduced 2 stack RGB OLED in which RGB OLED has the same tandem structure as WRGB. 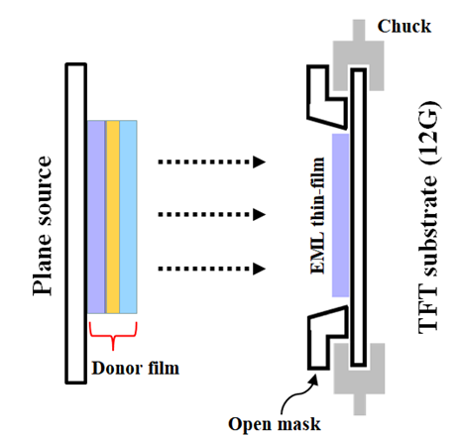 Because 2 stack RGB OLED can be thick due to adding a layer of CCL (charge generation layer) to the multi-layer structure, HTL is made thinner than before and the charge balance of the emitting layer is optimized. 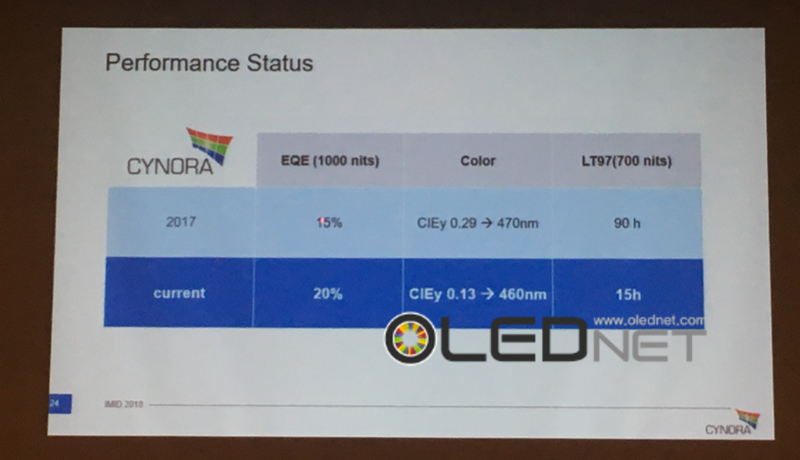 As a result, the 2-stack RGB OLED shows 1.5 ~ 2 times higher emitting efficiency than the 1-stack RGB OLED. Its lifetime is increased by 4 times on T80 basis. 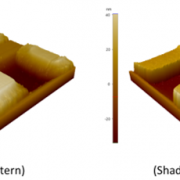 However, the 2-stack structure has a disadvantage in that it has higher power consumption than the general structure. Thus, it is necessary to make efforts to solve this disadvantage. http://olednet.com/wp-content/uploads/2018/08/LGD1.png 1125 1500 Daejeong YOON /wp-content/uploads/2015/09/logo_oled.png Daejeong YOON2018-09-11 08:50:002018-09-11 08:50:00[IMID 2018] LG Display, showcased 2-stack RGB OLED for automobile OLED with improved life span. 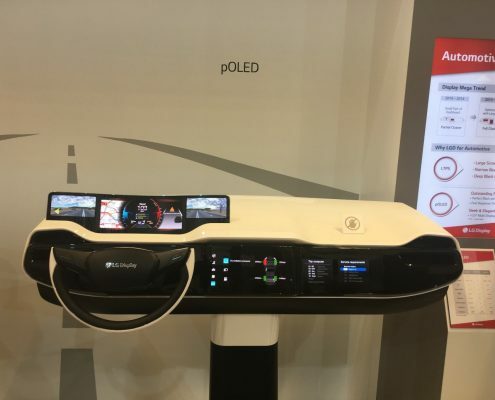 [IMID 2018] LG Display and Samsung Display exhibited a large number of large, and small & medium sized OLED applications. 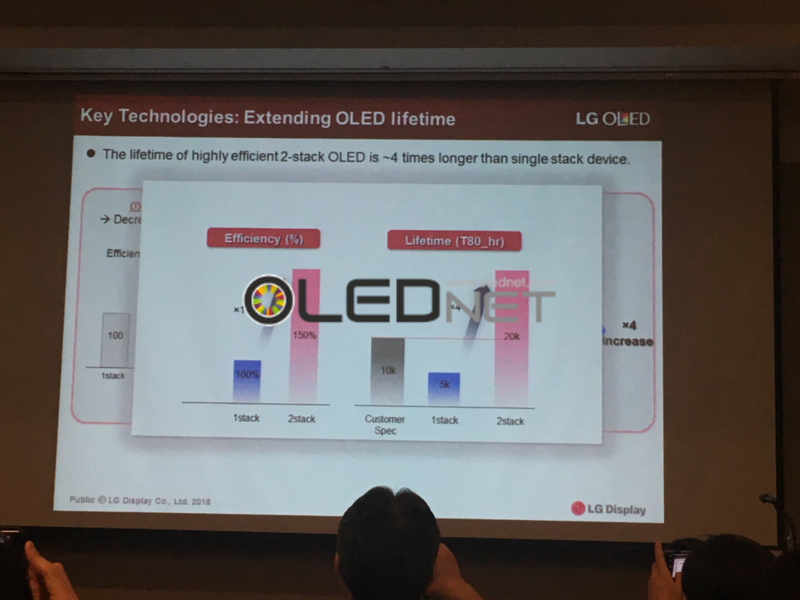 LG Display and Samsung Display introduced a number of applications using OLED at IMID 2018 held in BEXCO, Busan, drawing attention from many visitors. 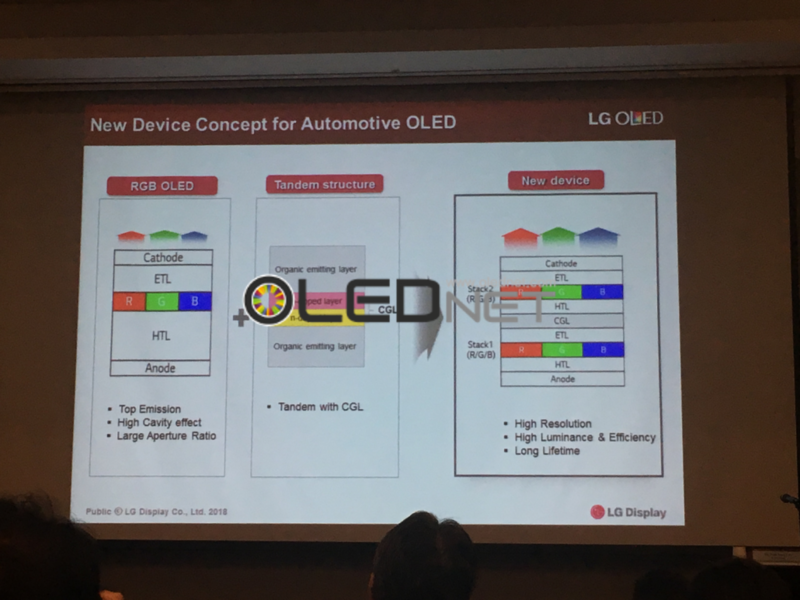 In particular, LG Display displayed its strategies mostly for large OLED applications such as 77-inch transparent OLED and 55-inch video wall OLED, while Samsung Display introduced the small and medium sized OLED applications mainly for automotive and virtual reality devices. 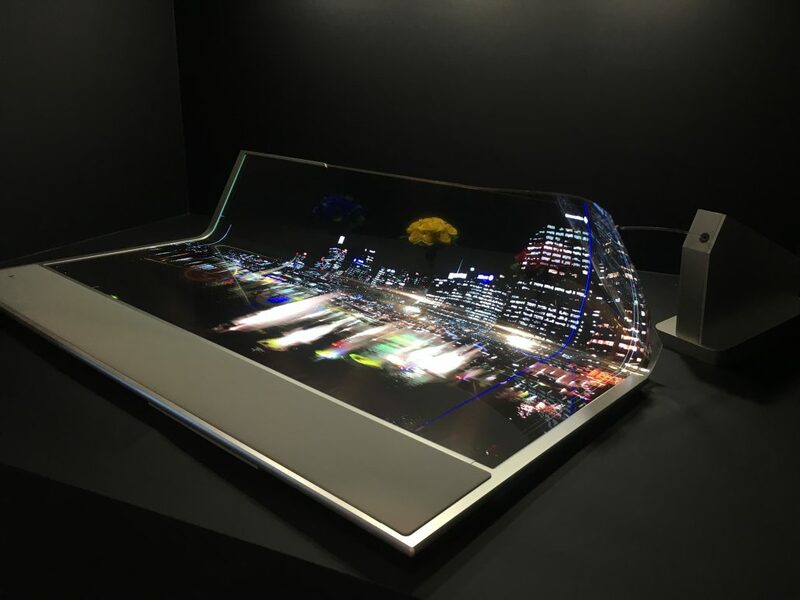 First, the panel thickness of the 77 inch transparent flexible OLED introduced by LG Display is 400 μm, the bending radius is 80 mm, and the luminance is 200 nit based on full white. 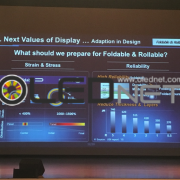 LG Display explained that it would improve the required transmittance and durability. 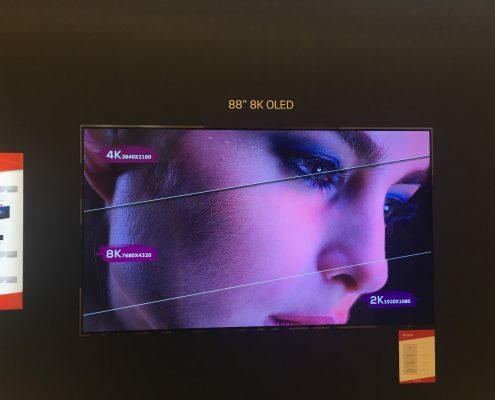 Also, it commented that the goal is to reduce bezel to 0.5 mm at its display of 4 FHD OLEDs with 3.8 mm bezel. In addition, LG Display presented a 1200ppi 4.3-inch WRGB OLED for virtual reality devices. 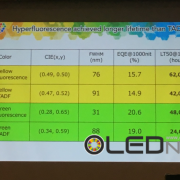 One official explained that WRGB OLED, which represents the resolution by etching the color filter, would be advantageous for higher resolution than RGB using the deposition method. 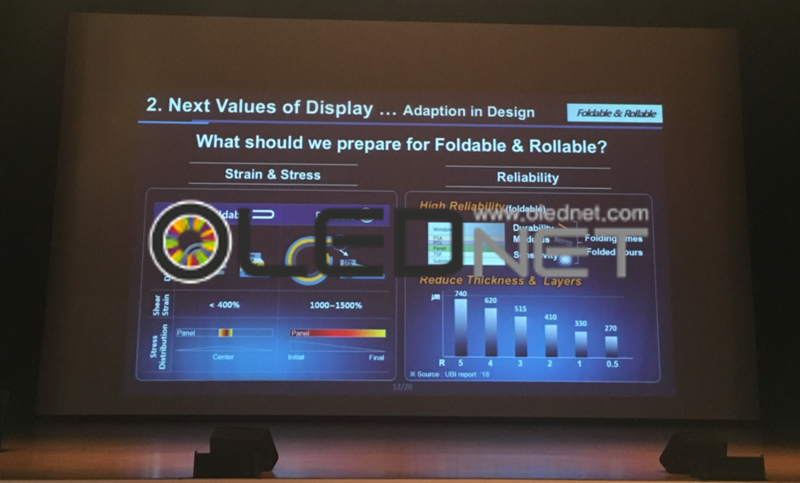 Meanwhile, Samsung Display exhibited a number of automotive OLEDs, including unbreakable OLED for 6.22 inch steering wheel, 1000R curved OLED for passenger monitor, transparent OLED for HUD, S-curved OLED for CIO and rollable OLED. 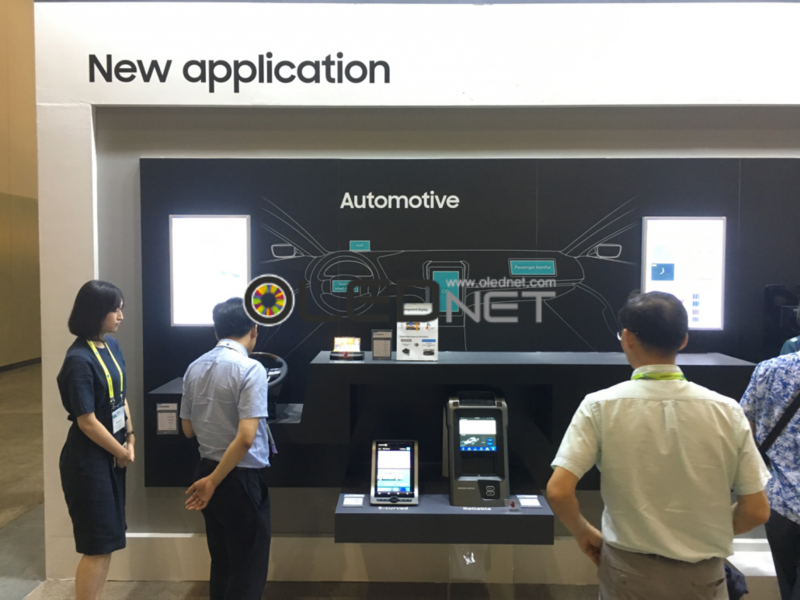 The concerned official expects the OLED to be widely applied to inside automobiles because it has excellent design autonomy, compared to LCD. 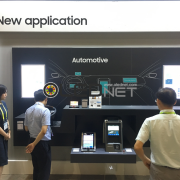 He added “Although there are many things to be improved, such as brightness and reliability, it is continuously improving the required performance through the feedback from European customers”. Furthermore, Samsung Display showcased light field display and 2,000ppi resolution RGB OLED for virtual reality devices. 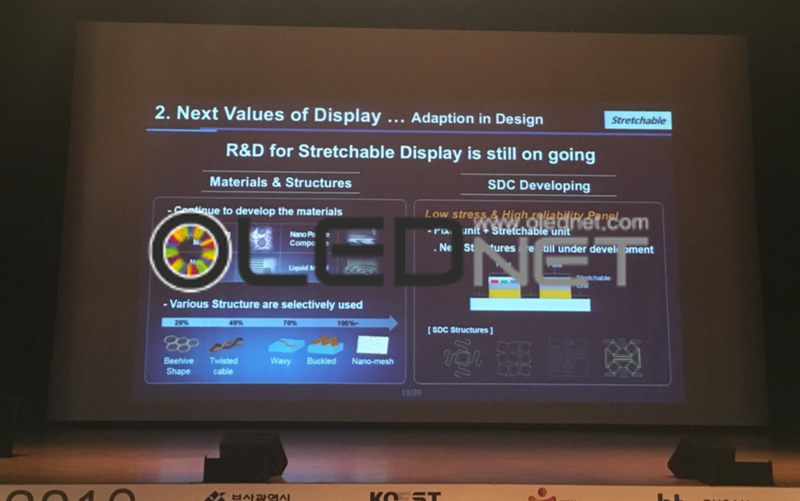 http://olednet.com/wp-content/uploads/2018/08/LGD1.jpg 3024 4032 Daejeong YOON /wp-content/uploads/2015/09/logo_oled.png Daejeong YOON2018-09-11 08:46:102018-09-11 08:46:10[IMID 2018] LG Display and Samsung Display exhibited a large number of large, and small & medium sized OLED applications. 8월 29일 부산 BEXCO에서 개최된 IMID 2018 에서 곽진오 Samsung Display 부사장은 ‘The Infinite Evolution with Display’를 주제로 기조연설을 진행하며, “디스플레이가 스마트 세계를 연결해줄 핵심 소재가 될 것이며 새로운 세계와 환경의 창조를 가속화 할 것”이라 강조했다. 곽 부사장은 생물의 진화와 디스플레이의 진화를 비교하며 ‘소형부터 대형까지 디스플레이 크기의 다양성(size diversity)과 full screen, flexible 등 디자인 적응(adaption in design), 다른 기술들과의 통합(convergence)’ 등 차세대 디스플레이가 나아갈 방향을 제시했다. 크기의 다양성에서 곽 부사장은 “중소형 부분에서는 현실감을 느낄 수 있는 고해상도의 디스플레이가, 대형 부분에서는 영화관의 큰 화면처럼 몰입 할 수 있는 디스플레이가 요구된다”라고 밝혔다. 이어서 디자인 적응에서는 차세대 디스플레이의 가치 중 하나로 디자인 자율성을 언급하며, 중소형 디스플레이는 폴더블 디스플레이 뿐만 아니라 롤러블과 스트레처블 디스플레이의 가치를 강조했다. 곽 부사장은 현재 이슈가 되고 있는 폴더블 디스플레이 뿐만 아니라 롤러블 디스플레이도 개발하고 있다고 언급했다. 폴더블 디스플레이와 다르게 패널 전면에 가해지는 스트레스를 고려해야 하는 롤러블 디스플레이는 말려져 있는 시간과 말았다 펴지는 횟수 등 고려해야 하는 사항이 많기 때문에, 이를 해결하기 위한 연구를 진행하고 있다고 발표했다. 또한 디스플레이 패널을 자유자재로 형태를 구현할 수 있는 스트레처블 디스플레이도 소개하며, 낮은 스트레스와 함께 높은 신뢰성을 갖는 디스플레이 구현을 위해 RGB 픽셀 유닛과 스트레처블 유닛을 활용한 다양한 구조들을 개발하고 있다고 설명했다. 융합 부분에서는 바이오 기술들을 거론하며 헤모글로빈에 빛을 투과해 산소포화도를 측정하거나.멜라토닌 변화에 따라 디스플레이의 wake up 모드와 sleep 모드 변화 등 새로운 융합 기술도 고려해야 한다고 언급했다. 마지막으로 곽 부사장은 앞으로 열릴 5G 시대에서 디스플레이가 개인과 스마트 세계를 연결할 핵심 소재임을 강조하며 새로운 사회와 환경을 창조하기 위해 디스플레이는 지속적으로 진화하고 있다고 설명하고 발표를 마무리했다. LG Display와 Samsung Display가 부산 BEXCO에서 열리고 있는 IMID 2018에서 OLED를 활용한 다수의 application을 선보이며 관람객들의 이목을 집중시켰다. 특히, LG Display는 77인치 transparent flexible OLED와 55인치 video wall OLED 등 대형 OLED application 위주로 전시한 반면, Samsung Display는 자동차용과 가상현실 기기용 OLED 등 중소형 OLED application을 주로 선보이며 뚜렷하게 서로 다른 사업 전략을 선보였다. 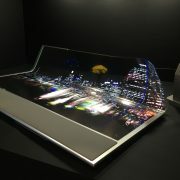 먼저, LG Display에서 77 inch transparent flexible OLED의 패널 두께는 400 um, 곡률 반경은 80 mm, 휘도는 full white 기준으로 200 nit다. LG Display는 부족한 투과도와 내구성을 더 개선시킬 것이라 언급했다. 또한, 3.8 mm narrow bezel을 가진 4장의 FHD OLED를 전시하며 bezel을 0.5 mm 까지 줄이는 것이 목표라고 설명했다. 이 밖에 LG Display는 가상현실 기기용 1200ppi 4.3 인치 WRGB OLED를 선보였다. 관계자는 color filter를 에칭하여 해상도를 나타내는 WRGB OLED가 증착 방식을 이용하는 RGB보다 고해상도에 유리할 것이라고 설명했다. 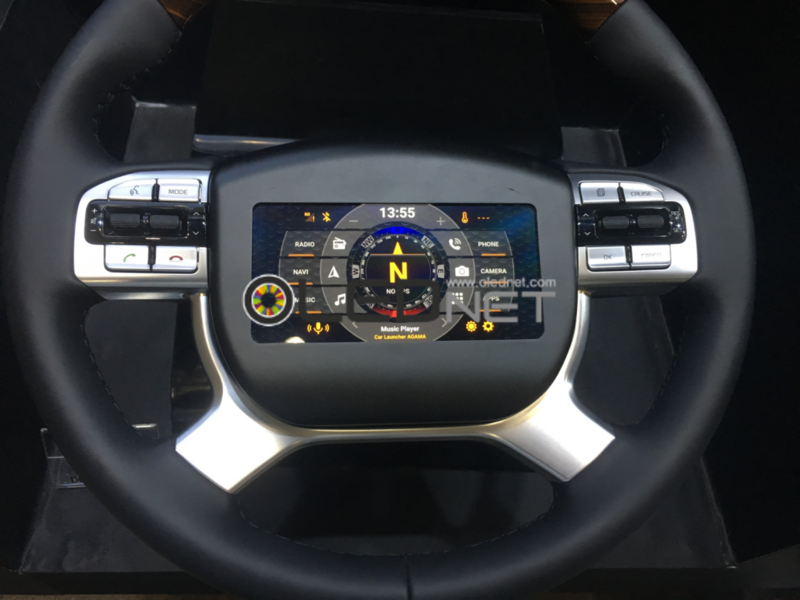 한편, Samsung Display는 6.22인치 steering wheel용 unbreakable OLED와 동승자 모니터용 1000R curved OLED, HUD용 투명 OLED, CID용 S-curved OLED, rollable OLED 등 OLED를 활용한 다수의 자동차용 OLED를 전시했다. 업체 관계자는 OLED가 LCD보다 디자인 자율성이 매우 뛰어나기 때문에 자동차 내부에 폭 넓게 적용될 수 있을 것이라 기대했다. 아직 개발 중인 단계로 휘도와 신뢰성 등 개선해야 할 사항은 많지만, 현재 유럽의 고객사들과의 피드백을 통해 지속적으로 성능을 개선하고 있다고 설명했다. 이 밖에, Samsung Display는 light field display와 가상현실 기기용 2000ppi 해상도의 RGB OLED 등을 선보였다. 8월 29일 부산 BEXCO에서 열린 IMID 2018에서 LG Display의 김관수 연구위원(research fellow)은 자동차용 디스플레이에 적용될 새로운 OLED 기술에 대해 발표했다. 김 연구위원은 현재 모바일 기기에 적용되고 있는 RGB OLED와 TV에 적용되고 있는 WRGB OLED는 수명 측면에서 고객사들의 요구를 만족시키지 못하고 있기 때문에, 이를 해결하기 위한 방법으로 RGB OLED를 WRGB처럼 tandem 구조를 갖는 2 stack RGB OLED를 소개했다. 2 stack RGB OLED는 다층구조에 CGL(charge generation layer) 층이 더해져 두께가 두꺼울 수 있기 때문에 HTL을 기존보다 얇게 만들고 발광층의 charge balance를 최적화하였다. 그 결과 1 stack RGB OLED보다 1.5배에서 2배 향상된 발광효율과 함께 수명이 T80 기준으로 4배 이상 증가하는 효과가 나타났다고 보고했다. 하지만 2 stack 구조는 일반 구조에 비해 소비 전력이 높은 단점이 있어 이를 해결하기 위한 노력이 필요하다고 지적했다.